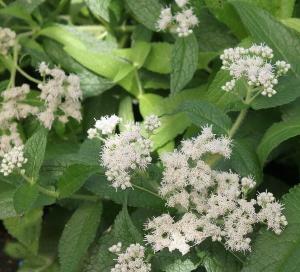 Eupatorium fistulosum f. albidum 'Ivory Towers' is a good architectural plant. A clump forming perennial with tall fresh green stems. During the summer months it produces large umbels of ivory-white flowers. Attracts butterflies. Grows in full sun or partial shade. Hardy. Height 2m.